BJH completed an economic and fiscal impact analysis as a part of Angels LandingPartners’ response to a City of Los Angeles request for proposals to develop the 2.24-acre vacant Angels Landing site. Angels Landing Partners is comprised of the Peebles Corporation, Claridge Properties, and MacFarlane Partners. The proposal included the development of two mixed-use towers of 24 and 88 stories, comprised of apartment, condo, hotel, school, and retail/restaurant programs. BJH estimated the potential economic impacts (measured in direct, indirect, and induced jobs, wages, and economic output in Los Angeles County) and fiscal impacts (measured through net new taxes to the City of Los Angeles) that would be generated by the proposed development. In December 2017, the City of Los Angeles selected Angels Landing Partners to develop the site. BJH was engaged by the City of Boston Mayor’s Office of Economic Development to develop a food truck market report that analyzed the potential for program expansion and improvements. The report was prepared in conjunction with the Boston Small Business Plan, released in 2016, which seeks to support micro businesses, including food truck owners, and to bolster an equitable economy that offers employment and entrepreneurship opportunities to a diverse group of Bostonians. BJH analyzed primary and secondary data to identify geographic areas that are underserved by food trucks, assessed the costs and benefits of the program to the City of Boston, and explored the mechanics of other cities’ food truck programs. BJH also conducted three focus groups and several individual interviews with food truck owners and other food truck sector stakeholders. BJH used these analyses to help inform a set of recommendations surrounding opportunities for new or enhanced food truck sites and programmatic and administrative improvements to Boston’s food truck program. BJH served as the financial analyst for the team selected by Empire State Development to assess the redevelopment potential of an 8-acre State-owned parcel of land in downtown Albany. The State sought guidance on a strategy that would encourage private sector interest in purchasing and developing the site despite challenging market conditions. Based on interviews with key stakeholders and a review of real estate market trends, BJH advised the team on two potential redevelopment scenarios that would leverage demand for housing in the area and introduce new commercial and open space amenities. Moreover, BJH prepared a phasing schedule for redevelopment that reflected market demand and absorption projections. This work will inform Empire State Development’s strategy to redevelop the property. The final report can be viewed here. BJH, with a team of transit and economics consultants, contributed to a Port Authority of New York and New Jersey (PANYNJ) report detailing the connectivity benefits created by the flow of goods and services in and out of JFK Airport in Jamaica, Queens. BJH analyzed primary and secondary data on employment, wages and business expenditures for on- and off-airport businesses and government employers, such as airport operations (FAA tower, parking operations, TSA, Customs and other public agencies, in-terminal retail and service concessions, and on-property hotels), aviation services (maintenance, fueling, and support services), and off-airport related services (catering, hotels, car services, freight forwarders, and warehousing). The League Education and Treatment Center is a non-profit in Brooklyn that provides services to clients with psychiatric and developmental disabilities. The League Center asked BJH to review its current operations and real estate holdings to identify opportunities to maximize value and reduce costs. BJH engaged an architect to assist in the facilities review and to create program and development scenarios. BJH prepared a report that outlined to League Center leadership options that would better align its real estate holdings with its program needs and financial capacity. 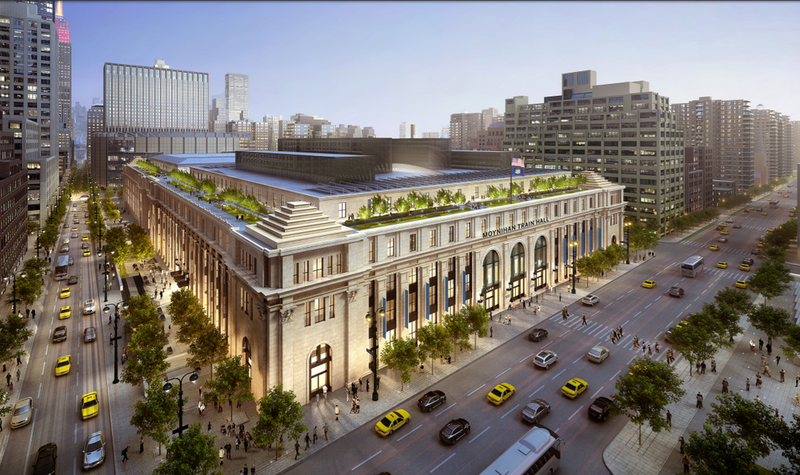 Empire State Development (ESD) / Moynihan Station Development Corporation (MSDC) engaged BJH to provide real property tax analysis, financial feasibility, and underwriting support for the Moynihan Station redevelopment project. Using its expertise in New York City tax and incentive policies, BJH was able to assist ESD / MSDC in negotiating the payment in lieu of tax (PILOT) structure in the State’s ground lease with the selected developer. Arriving at an appropriate PILOT structure required BJH to determine baseline market and assessed values for comparable properties, project the property taxes that would be due from the repositioned asset, and advise on available incentives and current tax policy in the geography. ESD / MSDC used BJH’s work in support of a successful effort to obtain a Transportation Infrastructure Finance and Innovation Act(TIFIA) loan from the U.S. Department of Transportation. BJH prepared and presented materials on project economics and estimated PILOT revenues to rating agencies, including stress testing for downside scenarios. BJH advised National Elevator Cab and Door Corp. (National Elevator), New York City’s premier designer and manufacturer of elevator cabs and doors, on its application for discretionary benefits from the Empire State Development Corporation. National Elevator applied to defray a portion of the capital investment it is incurring as part of its move to a new, custom-renovated production facility at the Brooklyn Navy Yard. BJH also assisted with National Elevator’s lease negotiations at the Brooklyn Navy Yard, where it will relocate in 2019. Moving to the Brooklyn Navy Yard will allow National Elevator to offset increasing operating costs and retain all 100 of its current employees, including approximately 70 union members, and to continue to grow and service its clientele in New York City. BJH Advisors, working with VHB and BAE, prepared a market report identifying the current trends in the New York City hotel market. The report was used to inform New York City Department of City Planning’s proposal for a Special Permit for hotel development in light manufacturing districts in New York City. 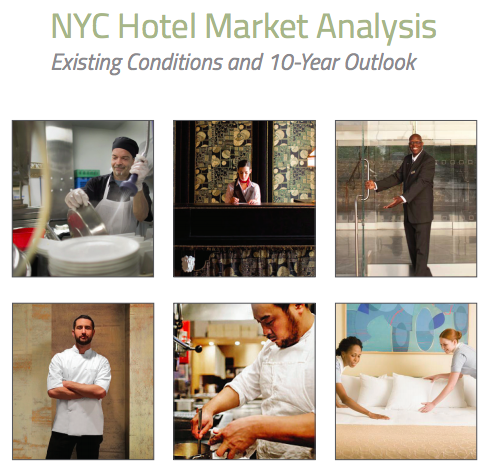 The report presented an overview of the hotel industry in the City over the past decade, as well as current and projected future conditions. The report also included comprehensive analyses of trends related to hotel development patterns, demand drivers, occupancy and revenue and the projected development pipeline for new hotel construction and delivery, both in manufacturing areas and in the City overall. BJH was engaged by Design Trust for Public Space to assist with analysis for its Future Culture: Connecting Staten Island’s Waterfront project, which aims to provide a set of recommendations to strengthen culture and enhance the waterfront on Staten Island’s rapidly developing North Shore. BJH conducted an economic impact analysis of the arts and cultural sector on the North Shore. The analysis included direct, indirect, and induced economic impacts driven by a broad cross section of organizations contributing to culture in the area including arts and cultural organizations, community organizations engaged in arts and cultural activities, maritime businesses in connection to the area’s heritage as a maritime hub, individual artists, recreational spaces, and independently owned food businesses on Staten Island’s North Shore. The analysis examined the impact of these sectors on the economies of both Staten Island and New York City. BJH also conducted a real estate market analysis to compare historic supply and demand for the retail, office, and industrial markets on the North Shore and Staten Island as a whole. BJH was engaged by NYU Tandon School of Engineering to estimate the economic impact of its Future Labs program since its inception in 2009. Future Labs is comprised of the Urban, Data, Digital, and Veteran Future Labs, each of which incubates startup companies by providing them with targeted guidance, expertise, resources, and a community of similar businesses. The analysis estimated the direct, indirect, and induced jobs, wages, and economic output generated by the Future Labs program. BJH served as the economic and real estate analyst for the team selected by the New York City Department of Cultural Affairs to prepare CreateNYC, the first ever cultural plan for the City of New York. BJH supported the team in its extensive community engagement process and conducted a literature review focused on sectoral analysis, labor market analysis, and social impact. BJH also prepared a comprehensive economic impact analysis of the cultural sector in New York City, which identified the total number of workers employed in cultural jobs in New York City, the total wages, and the total output associated with cultural sector. BJH projected the indirect and induced impact of the cultural sector in New York City. This work laid the foundation for the several recommendations put forth in the plan focused on supporting job growth and interagency coordination, as well as the recommendation for increased funding to support cultural organizations as engines of economic growth in New York City. The final plan was announced in July 2017 and can be downloaded here: http://createnyc.org/en/home/. BJH Advisors (BJH) worked with a food industry expert and planning and design firm to analyze the feasibility of, and develop a preliminary concept for a culinary incubator in the City of Amsterdam, New York and the Montgomery County Business Development Center. The team outlined a concept for a non-profit incubator in the Southside neighborhood that will respond to community needs, create jobs, and attract locals and visitors. The incubator concept includes two kitchens, a food hall, a retail shop, a multi-purpose event space, an outdoor farmers’ market, a teaching garden, and a seating area. BJH conducted analyses of demographic, economic, and real estate market conditions; retail leakage for selected industries; and benchmark case studies for similar tourism/destination-based demand food concepts. For the Village of South Nyack Economic Sustainability Study, BJH provided real estate analysis as part of a consultant team. The team evaluated the potential for the redevelopment of land over and surrounding Exit 10 on the New York State Thruway. As part of the study, BJH prepared a high-level financial feasibility for the preferred redevelopment scenario, and made recommendations on next steps toward implementation. BJH was the project manager and prime consultant for the State of New York, managing a multi-disciplinary team that developed a Downtown Revitalization Strategic Action Plan for the Village of Westbury in Nassau County, Long Island. The Downtown Revitalization Initiative is a $100 million initiative of Governor Andrew Cuomo which provided 10 towns throughout New York State with $10 million in downtown revitalization funds. Westbury, a 2.4 square mile Incorporated Village in Nassau County along the Long Island Rail Road, was selected for the initiative by the Long Island Regional Economic Development Council. BJH led a team in coordinating a committee of local stakeholders, executing public engagement events, studying existing conditions, and identifying projects to help bring about the revitalization of the downtown. Once projects were identified, BJH and its team prepared an implementation plan that identified the cost of the project, regulatory processes, and partners to implement each of the projects. Projects included a rezoning that would promote transit-oriented development and increased residential density near the train station; a commercial attraction program that would provide grants to new, targeted retailers for fit out; a comprehensive streetscape improvement plan that included street plantings, benches, new lighting, among other streetscape elements; and a redesign of the key intersection that connects the Long Island Rail Road station to the downtown. The funded projects are expected to be implemented between 2017 and 2020. The final plan can be found here. BJH Advisors was the real estate and financial advisor for the Radson - Kingspoint Heights winning submission to the NYCEDC for development of 495 Eleventh Avenue (the former Slaughterhouse site) in Hudson Yards. The project comprises approximately 700,000 square feet in a 45 story tower, including NYPD space, retail, community facility, Class A office, dormitory, and approximately 230 affordable housing units. BJH helped assemble the project team, including the architect, geotech and structural engineer, and land use and real estate counsel. BJH project managed the submission package and helped align the program with Mayoral and community priorities. BJH performed project underwriting, and assisted the developers in discussions with debt and equity sources. Radson – Kingspoint Heights was advised by BJH throughout the negotiation with NYCEDC over program, scale, real property tax obligations, ground rent, and affordability levels of the residential units. In addition to undertaking Uniform Land Use Review Process for the disposition and rezoning, the project will require ongoing and significant coordination with public agencies. The Brooklyn Brewery engaged BJH to assist it in siting and developing a new 400,000 to 1,000,000 barrel brewery. The Brewery sought to expand capacity primarily to serve overseas markets in Northern Europe where demand has been growing exponentially. Ideally, the Brewery sought to locate within close proximity to the Port of New York and New Jersey, and at a site that either had rail or where rail could have been easily activated. BJH’s project scope involved undertaking location analysis, including performing tax and economic development program and benefit level comparisons across jurisdictions, as well as negotiating with land owners, determining timeframes and processes for obtaining discretionary land use and other development approvals, interfacing with public partners, and analyzing capital requirements and potential for investor returns. BJH completed a series of benefit cost analyses regarding the implementation of an integrated flood protection solution in Red Hook, Brooklyn. The proposed flood protection could stretch up to three miles around the waterfront neighborhood’s perimeter, providing protection to the thousands of residents that were severely affected by Super Storm Sandy. The analysis considered avoided damages from property structures and contents, as well as displacement, loss of work, and public service losses. It also quantified other social and economic benefits of the project. BJH then calculated the overall benefit cost ratios per FEMA methodology for multiple flood protection alignments to be submitted as part of the City’s HMGP application. A brochure summarizing the findings of the study can be viewed here. BJH advised the Cypress Hills Local Development Corporation for four years on implementation of strategies outlined in its BOA proposal to the State of New York and in a separate 2013 Report entitled “Manufacturing Opportunity Analysis.” Implementation strategies included working to repurpose underutilized City-owned manufacturing zoned land with New York City based food manufacturing and distribution firms that sought to expand, identifying key economic development programming to support industrial development, and working on financial feasibility analysis regarding various development scenarios for the construction of new, model urban industrial facilities. The principals of BJH have worked on various aspects of the Hudson Yards redevelopment project since 2002. In 2017 BJH provided analysis of current and potential future development in the district as a sub-consultant to a national real estate firm for a feasibility study in support of the successful refinance of $2.1 billion of bonds issued by Hudson Yards Infrastructure Corporation. Services included demand analysis and tax and alternative revenue source estimation. In 2015 BJH prepared a development analysis and revenue projection report of the district for an investment bank. The study included a survey of residential, hotel, office and retail buildings completed, in construction and planned in the district, and estimation of current and future real property tax revenues, PILOT payments, and zoning bonus payments.